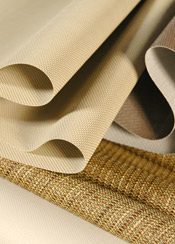 We work with all of the top shade cloth weavers and we can match specified fabrics and offer custom options. 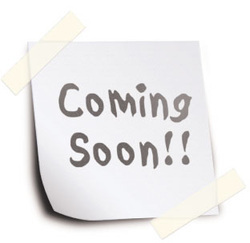 All of the fabrics in our commercial line are fire rated and carry a 10 year warranty. Our residential fabric line offers choices to match any decor and unique patterns and colors to compliment your design. We offer one of the widest fabric selections in the industry and we are constantly updating our inventory with fabrics from around the world. When considering larger sized shades, 78" or wider, you may start by considering the available fabric roll widths (some rolls as wide as 130") to see if it is possible to avoid railroading and seaming the fabric. Composition of the fibers used in the weave and special features of the fabric could also be the starting point in the search for the right fabric, it all depends on your application. 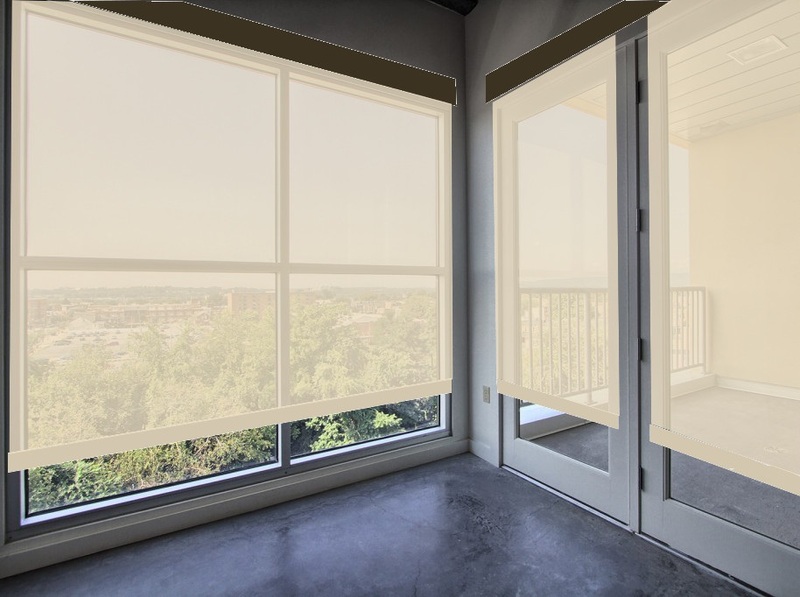 A sheer fabric will cut the glare while still allowing light in and preserving the view. A light colored privacy fabric will light up the interior during the day while maintaining privacy. Blackout fabric is used to darken a room and offers the most privacy, day or night. Color is a key factor in selecting a sunscreen shade cloth. Color can directly affect heat gain (shading coefficient), brightness, and glare. •Light colors are more reflective with lower heat gain and shading coefficients, but with a higher percentage of daylight and solar transmittance. •Light colors, however, are brighter when sunlit which causes high surface brightness (like looking at a bare frosted light bulb) and may transmit excessive, glare onto computer screens and work stations. •Darker colors provide a better view through the shade cloth to the outside. Dark colors absorb light and can generate heat, and are less energy efficient than lighter colors (unless a performance dark fabric is used like KOOLBLACK or SilverScreen). They transmit less light and have a lower surface brightness, which lowers reflectivity and provides excellent glare-free environments for CRTs and work stations. There are many color options available. If you are working with a designer, you might have some idea where to begin when selecting fabric color. Even if you are on your own, or are a designer/builder/architect yourself, you can breeze through the color selection process by first determining what range of colors might work for your application. As described above, deciding whether to use light colored fabric as opposed to dark, will be a good start. For instance if you chose light colors, narrow choices down further to something in the white range, or a cream/bone/beige, or maybe light grays. Before you know it, you will have focused in on a few choices. Explore our fabric choices online and get a short list of your choices compiled, then contact us to discuss your selections and have us provide samples for your approval. We offer more fabric possibilities than can be listed here and we can work with Customer's Own Material in certain instances. Double-sided fabric is available and you may think the color facing the room is important, but it could be that the first thing you need to look at is the side of the fabric that faces the outside for either performance or aesthetic reasons. 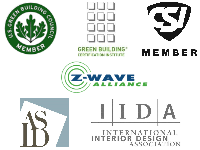 For example, if your project requires the exterior windows of a multi-dwelling building to all have a uniform color facing out, then you should start with this criteria and choose your face color from the pool of double-sided fabric choices that remain. We stock a selection of the widest fabric rolls available, some up to 130" wide, which allows us to offer the widest possible shades without any visible seams. Some fabrics only come in narrow rolls and in order to cover larger windows, railroading and seaming the fabric may be an option. 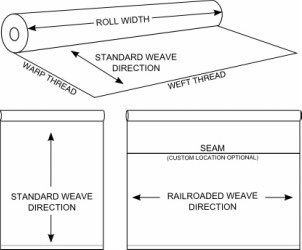 Railroading fabric is a method of assembling larger pieces of fabric out of fabric where the narrow roll width isn't wide enough to cover the width of the opening. The fabric is rolled sideways and seamed, similar to how the stripes on a sewn American flag are assembled. Seams are typically only about a 1/4" tall. Not all fabrics can be railroaded, so please call us for more information. Custom seam locations can align with window mullions or door handles or top of doors to mask their visibility. Custom seam locations may use more fabric, so there may be added cost.